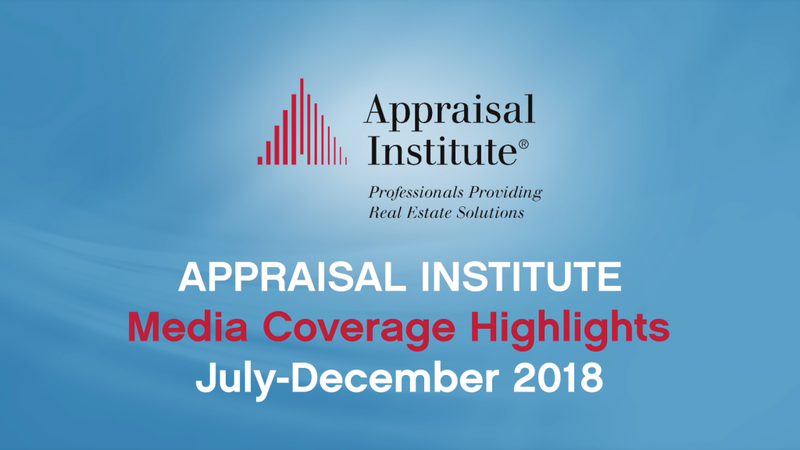 The Appraisal Institute continues to represent the valuation profession in media coverage across the country, reaching an audience of nearly 2 billion in the last six months of 2018. The Appraisal Institute and its Designated Members were included in nearly 2,000 news stories in almost 550 news outlets between July and December 2018, garnering a publicity value of more than $1.1 million. In its latest video, the Appraisal Institute’s media coverage in television, radio, newspapers, magazines, online outlets and trade publications are highlighted, including a Washington Post article that features 2018 President Jim Murrett, MAI, SRA, discussing appraisal regulations. Watch the video to see more media coverage highlights from the Appraisal Institute and its professionals.